Recently in the news here in the UK there has been much talk about the 'traffic light labeling system'. It is an easy way to keep track of what you are eating when on the go. At least once a week, I find myself picking up a sandwich as I travel between my activities across London. My eye catches the traffic label colors, but then I also read the other nutrition info. 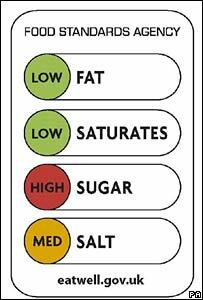 Click here for the FDA's guide on how to read nutrition labels. You can also check out Real Simple's guide for a quick and dirty how-to. If you are worried about your weight and/or body shape, exercise will help but nutrition will also play a major role.